This dessert features two extraordinarily simple dishes that when combined, become a masterpiece that you’ll want to recreate again and again. Compotes are extraordinarily easy to make. All you need to do is cook fruit in a syrup with various amounts of sugar. With this simple method as a base, you can experiment in a variety of ways. Keep some fruits whole, for textural contrast. Cook fruit in its peel for more flavor, then purée in a food mill, which also serves to remove the cooked peel. Depending on the natural juice content of the fruit, you can finish by mixing the fruit in the cooking syrup, or you can use the syrup as a sweetener in some fruit coulis, or boiled to make a thicker topping. I like to infuse the cooking syrup with additional ingredients, for variety. Vanilla, cinnamon, mint, citrus zest, cloves, almonds and coconut are all fine examples. Occasionally, I will substitute lavender or rosemary honey in place of sugar. Compotes were made to be paired with other sweet things. Top with whipped sweetened cream, adorn with ice cream and butter or sugar cookies, powder with vanilla or citrus-scented sugar, or enhance with sweet spices such as cinnamon or star anise. 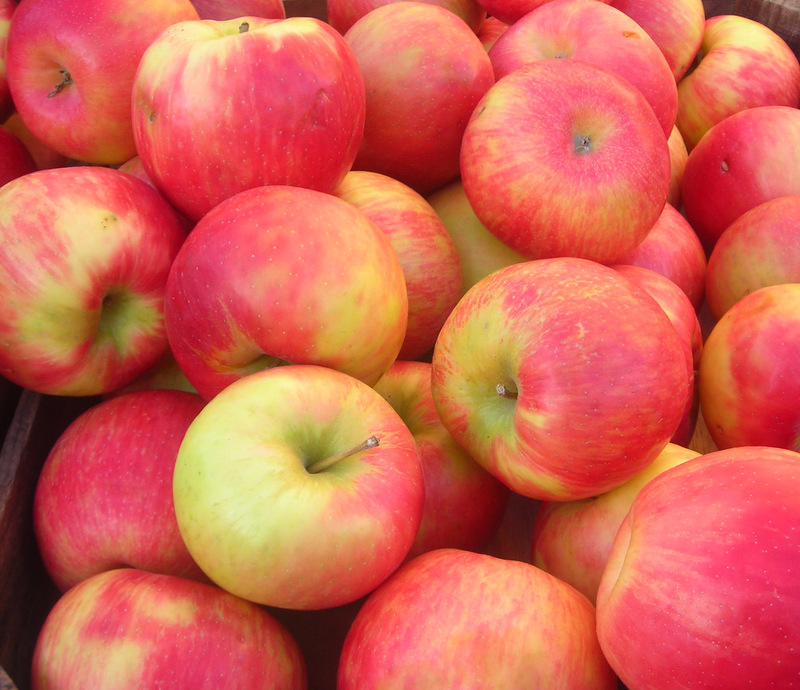 Honeycrisp is an apple cultivar that was originally developed by the University of Minnesota in the early 1970s. Originally slated to be discarded because it was first seen as a suboptimal variety, it has since become highly prized and desirable for its sweetness, tartness and firmness, making it an ideal apple for eating out of hand. 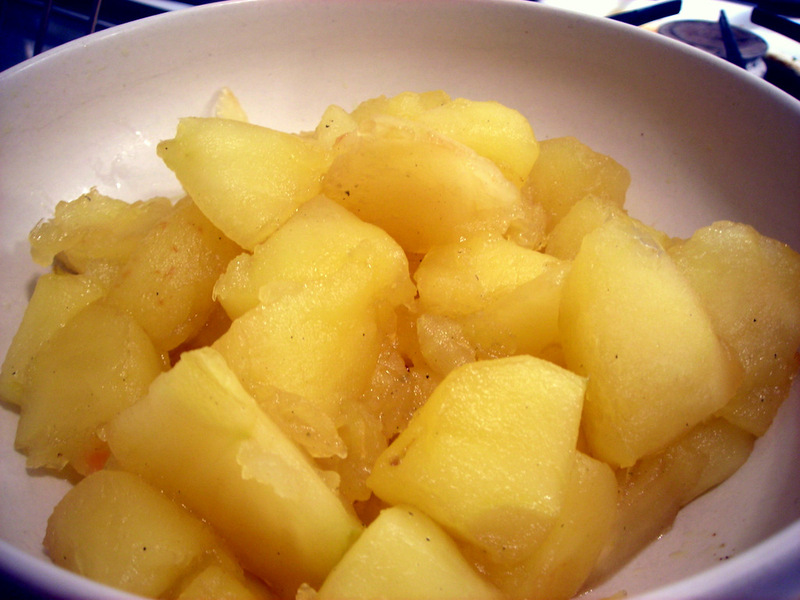 (1) — Substitute Golden Delicious apples if Honeycrisps are unavailable. (2) — This is simply sugar that contains one or two vanilla beans stored in the same container over several weeks. The vanilla beans infuse the sugar with their aroma and taste. Substitute regular sugar if unavailable. Quarter the apples and remove the cores and the seeds. Place the apples, sugar, lemon juice and ginger in a saucepan. Cover and cook for 10 minutes over medium heat, then uncover and cook for another 10 minutes. Stir frequently. You’ll want to keep an eye on things to ensure that the juice evaporates but that the fruit does not stick to the bottom of the pan. The compote is done when all of the liquid has evaporated. Discard the ginger. Pour the compote into a bowl. You can serve the compote as is, or set aside for another use. Stored in the refrigerator and wrapped with plastic wrap, it will keep for about three days. Combine all ingredients in a large mixing bowl and mix well until the consistency becomes smooth. Alternately, process in a blender or food processor. Cover, and set aside in the refrigerator to rest for two hours, or preferably, overnight. Heat a crêpe pan (a 7″ to 10″ lightweight skillet with sloping sides) or a non-stick skillet, then brush it with a little oil or melted butter. When it sizzles, pour in a little more than two tablespoons batter (if using a 7″ crêpe pan) or 1/4 cup batter (if using a non-stick skillet). Immediately swirl it around the pan. Cook until golden on the bottom, about 1 minute. Slide a knife or fork under an edge to loosen the crêpe, grab it with your fingers and flip it over. The second side should cook until its set, about 20 to 30 seconds. Lay the crêpe on a plate, then continue making the rest. If you stack the finished crêpes on top of each other, they will retain their heat quite well until all are done. Time: About 30 minutes, including prep. Does not include resting time for the batter, however. 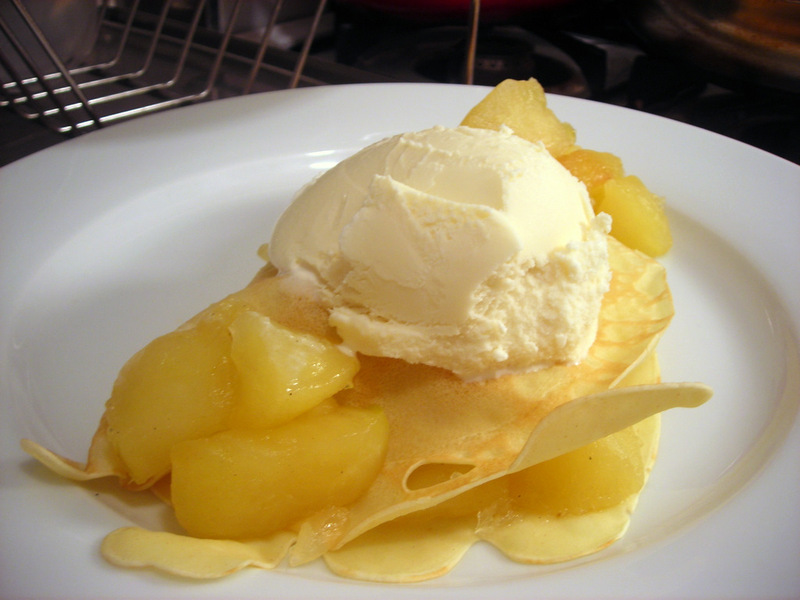 Lay a crêpe, golden side down, on top of a dessert plate. Spoon a couple of tablespoons of compote onto one side of the crêpe. Fold the crêpe over. Top with additional apple compote and a scoop of ice cream. Serve at once. 1. After mixing, the batter needs to rest so that it can fully absorb the flour, ensuring that the crêpes will be tender when cooked. Although you can use the batter immediately, it’s better to if it can rest for a few hours, or preferably overnight in the refrigerator. 2. If the batter is the right consistency, it will coat the pan quickly and evenly. Thin an overly thick batter by adding a little milk or water. The first crêpe almost never turns out okay, so just discard it and proceed with the second, which will probably be fine. Some people insist on greasing or oiling the pan prior to making each crêpe. In my experience, you only need to do this the first time. This is my third entry for Weekend Herb Blogging #318, which is hosted by Cinzia of Cindystar and organized by Haalo of Cook (almost) Anything at Least Once. Weekend Herb Blogging is a weekly foodblogging event that was originally begun by Kalyn of Kalyn’s Kitchen. 27 Jan	This entry was published on January 27, 2012 at 1:56 pm. It’s filed under food, food photography, vegetarian, Weekend Herb Blogging, winter and tagged apples, cooking, dessert, food photography, recipe, vegetarian. Bookmark the permalink. Follow any comments here with the RSS feed for this post. I don’t eat much sweets or desserts, but when I do I want something of quality – and this looks ‘right’. Honeycrisp Apples’ picture is gorgeous. Thanks for participating to WHB! That is beautiful – and looks delicious!